Many develop various health issues ranging from arthritis, macular degeneration, heart disease, to short-term memory loss and deterioration in sight and hearing, as well as many other health difficulties, as they age. In addition, there is the slowing down of mind and body. When hearing, sight and the ability to move about are diminished, the social aspect of living can be impacted significantly. Another major situation that can sometimes occur is the loss of the ability to be self-starting. Our frantic lifestyles cause other chronic conditions and comorbidities. Mon Ami™ can assist in living a balanced and healthy lifestyle for all concerned. While Mon Ami™ cannot be expected to solve all of these problems, it can be brought into the home to act as a support tool in the fight to remain healthy in mind and body. It can also help to address other needs such as lack of mobility, safety issues, difficulties with communication, and diminished social capabilities. On the right are the main services that Mon Ami™ offers to support users. These layered services are the result of years of research into the needs of families, starting from our own. They form a hierarchy of needs similar to Maslow's famous pyramid. [Maslow's pyramid]. 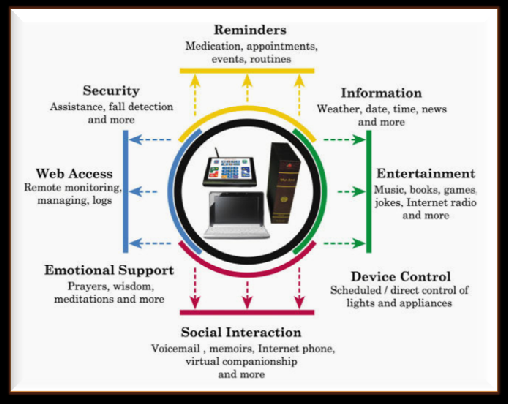 The following are just a few of the needs that can be addressed by Mon Ami™ which makes it a unique electronic support and Caregiver system. Follow the links to learn more.